One of the most common questions I think we as coaches get is, “What workouts should I be doing?” The question is loaded. One of the most common answers is that it depends. Ask 100 coaches and you might get 100 different answers. In this article you’ll hear about a workout you should be doing but probably aren’t. First off, I will say that this workout (or type of workout) applies to runners training for races that have multiple significant climbs and descents. If you are training for flat races, or for a race that has just a single climb and descent. This is not written for you or at least not for the race you are currently training for. In general, this workout is most applicable to runners training for 50k-100+ mile races with lots of ups and downs. One of the biggest questions in coaching and training for long distance races is this: “Why do we slow down?” If we can answer this question we may have a fighting chance to stack the deck in our favor. In more reductionist times, people liked to think that one thing or another was the culprit. Not enough oxygen, too much lactic acid, not enough glycogen, and so on. I am here to say that it’s probably never so simple. The body is a complex system where tons of things happening all at once. And at the center of this chaos is the brain. I am not going to pretend to be a scientist with lab coat and a thriving research program. I am a runner, but, I read a lot, and run a lot, and in the course of all this running and reading I’ve noticed there are things that make sense and things that don’t. One of the ideas about running and why we slow down that has made the most sense to me is the Central Governor Theory. I am not going to detail the history of thinkers that have contributed to this idea, but it’s basic premise is that our brain controls our physical output centrally, essentially receiving millions of little bits of information about all kinds of things from around the body. Not only is the brain reading this information, but the brain also knows what you know for instance, how many more miles you have to run, how hot it is, and how hot you think it’s going to be. Your brain knows how much farther you have to climb (if you have access to that information). Our brains are amazing and synthesizing a ridiculous amount of information, most of it subconsciously. So, why do we slow down when racing? We slow down because of everything. All the information our brain is capable of registering enters into some enormous equation and the output is how fast we run. There is a lot here, and if you think too much about this your head might spin like mine sometimes does. Now we’ll move onto something more specific and tangible: a workout. Most of us have heard different things about downhill training. We know we are going to have lots of downhill in many of the long trail races. And we all know that downhills can be hard, so we work on it. Many of us will create workouts or intentionally run faster on downhills during runs. Often we climb up a hill to start our run, go up and up, and then on the way back down we might “bomb” for a period to “season” our quads. While there is likely some merit to doing things this way, I am going to propose looking at downhill training a little differently. What is bad about downhills? Well, they destroy the quads right? I am going to go out on a limb and say this is not the worst thing that downhills do. Worse than the damage running downhills does to our muscles is the damage our brain thinks our muscles have sustained. Think about this: you just ran fast and hard down a three mile descent. The pitch flattens out at the bottom for a minute, but you’re quickly thrust back uphill. What does it feel like? I know for me the term struggle bus comes to mind. Starting out and getting up that next hill after a fast downhill can feel like a massive struggle. It can feel like this relatively early in a race, before we’ve had time to run out of energy and go to bonk town. The reason it is so hard involves something other than energy or oxygen. After sustaining the trauma of a long fast downhill our brain thinks we’ve caused a great deal of damage. This may be true to some extent, but you’ve been here before, and you didn’t die, your legs didn’t fall off. Your brain is not sure, though, so it decides that after sustaining the damage of downhill running it is going to unilaterally reduce your ability to put power to the ground. When you start to go back up that next hill your effort and pace will show this, sometimes in dramatic fashion. If all this is true, the question is, What can we do about it? At Trails and Tarmac we’ve been using a type of workout that we think can make a big difference in this department. At first we used it on ourselves, then on family, and then with some of our athletes. While we don’t have direct scientific evidence to show this type of workout is effective on a physiological or neurological level, we’ve seen enough racing success that we thought we’d share it with you. 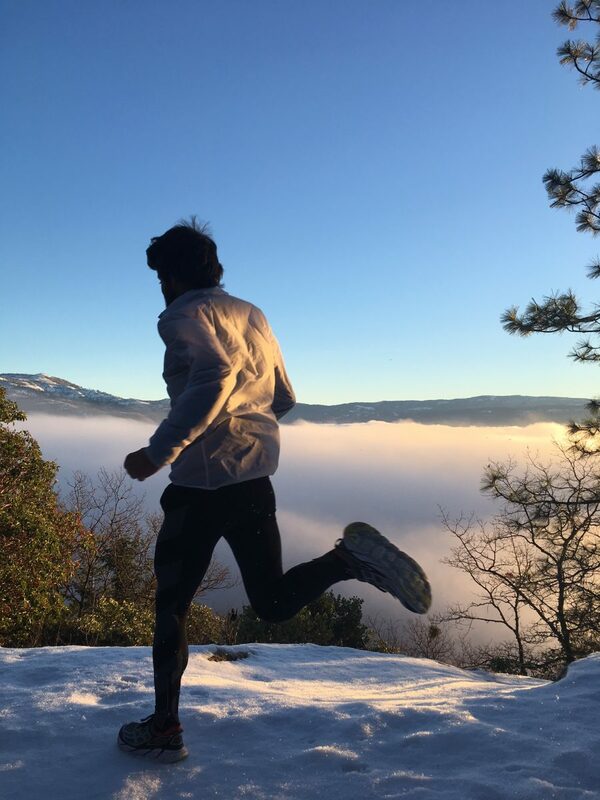 The workout is this: Run multiple sets of relatively short fast downhill runs followed directly by short to moderate length runs back uphill followed by a rest interval. Put into numbers, we might assign 15 min easy warm up, drills, 3X15 sec strides, -3X3 min downhill tempo straight into 6 minutes of uphill tempo, with 3 min easy flat/downhill jog between reps, and a 20 min easy cool down. So there you have it, there is the secret workout! If only it were that simple, right? You might be asking yourself after reading this, How fast downhill? How fast uphill? How fast of recovery? These questions cannot really be answered in a blog article. But, I’ll say that most motivated athletes generally go at least as hard as they need to on workout day, often too hard. That’s the short explanation. So, why have we set up this workout this way? Based on the Central Governor Theory, and considering that the likely culprit of our fast-paced demise in long hilly races is our brains’ interpretation of damage caused by downhill running we’ve come up with this workout to try helping our brains learn that the damage isn’t as bad as it thinks it is. We make the downhill reps pretty short, in order not to cause too much damage all at once, but enough to cause our brain to want us to slow down. Then, we turn back around and immediately go back up hill. This is the hard part. That transition between fast down to moderately hard up is tough. Initially you’ll see paces that are slower than you might normally see on a purely uphill repeat workout. This is caused by the fast downhill running. In setting up the workout this way we are teaching the neurological system to allow us a little more leeway and a little more power for the next climb. Do this type of workout a few times and you’ll start to see a difference in your post downhill bombing ability to climb. In long races, it should translate to a faster finishing time. There are a lot more questions I could try to answer here, Like how many times should I do this workout before a race? How many times per week? Should I do this workout all year? In short I’ll say that a handful of weeks of consistently doing this type of workout once per week should yield some results. Don’t overdo it. You want to get faster and stronger, but you also want to be hungry and healthy come race day. Thanks for reading, and have fun! Try this workout for yourself. Come over to the Trails and Tarmac Strava Page and share your downhill/uphill workouts with the group. We’d love to see how it goes for you.